DMC Champion DJ Rasp takes it to the next level in this new turntablism routine, using djay Pro and two Pioneer XDJ-1000s. Algoriddim has partnered with Pioneer to give you seamless integration of djay Pro with the CDJ-2000nexus, CDJ-900nexus, and XDJ-1000, the worldwide club standard for professional DJs. Access your Spotify and iTunes playlists directly from the CDJ’s and XDJ’s screens. We are excited to announce our collaboration with Casio on the next generation DJ controller XW-DJ1 for Mac, iPad, and iPhone. 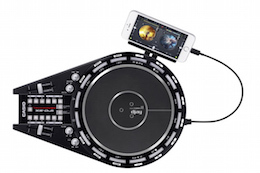 The XW-DJ1 is a battery-powered, all-in-one compact DJ controller with a built-in speaker. Easy to carry, the XW-DJ1 lets you perform wherever you are without any fuss. Thanks to an original, symmetric, single-disk design, it allows you to DJ easily whether right- or left-handed. The XW-DJ1 is equipped with a 7-inch wide scratch disk that simulates the grooves on analog records. It feels as if you’re spinning an actual vinyl record, enabling the lifelike scratching of a turntablist. We’ve released a massive update to djay Pro, free to all existing users, with live video mixing, plug & play support for the Pioneer CDJ and XDJ line-up including enhanced Spotify integration. The all-new video mode in djay Pro allows you to apply visualizers to you music and mix videos in real-time, all with stunning transitions, visual FX, title and image overlays, live A/V recording, and comes with extensive pre-bundled video content so you can get creative right away. Furthermore, we’ve partnered with Pioneer DJ for a seamless plug-and-play integration of djay Pro with the CDJ-2000nexus, CDJ-900nexus, and XDJ-1000, the worldwide club standard for professional DJs. For the first time, DJs can access Spotify playlists directly from the CDJ and XDJ screens including displaying waveforms, song information, and cue points. Spotify integration in djay Pro now supports high quality bit rate with up to 320 kb/s. Other new features in this update include Finder integration, External Mixer Mode, new collection album cover view, song recommendations, 8 cue points per deck and history sessions export as CSV, iTunes, or Spotify playlist, and plug & play support for Numark Mixtrack Quad, Mixtrack Edge, and Denon MC6000, MC6000MK2, MC2000. djay turns your Apple Watch into an ultra-portable DJ system. Whether you’re mingling with guests or rocking out on the dance floor, djay allows you to leave the DJ booth without ever missing a beat again. You can browse your music library, cue up and mix your favorite songs from iTunes and Spotify, all while controlling stunning audio effects, and loops in real-time – right from your wrist. Use Automix to take song requests on-the-fly and have them mixed for you automatically. Download djay for iPhone and Apple Watch on the App Store. Coming as a major update to djay for Android, version 2.1 fully leverages the enhanced audio capabilities of Android 5.0 Lollipop to support USB audio devices with separate dual stereo outputs, and further adds support for the Pioneer DDJ-WeGO3 DJ controller. * Multi-channel audio output is supported with Pioneer DDJ-WeGO3, Reloop Beatpad, and Griffin DJConnect. Version 2.1 is a free update for all existing users of djay for Android and available on Google Play and the Amazon Appstore.